Letting my geek show here a bit. 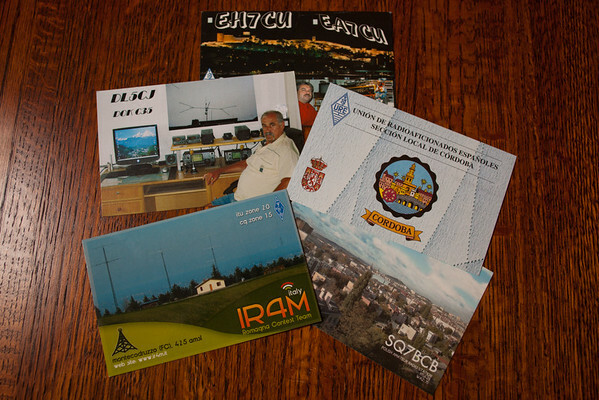 Got a few QSL cards from the bureau today. Yes, I'm an amateur radio operator, and yes I still send QSL cards back and forth to confirm my QSO's, even with all of the electronic logging and online logs like the ARRL's Logbook for the World. My dad is a ham, and I grew up seeing him get cards from all over the world, and eagerly waiting for envelopes from the bureau. This was a small bunch - only 5. I suppose perhaps they got sent as postage rates are about to change. I never know quite when they'll arrive. These are all Europeans, not really any that I needed to confirm. The oldest is from 2006, the newest, late in 2011. The photo was shot with the 5dII and 28mm lens - pretty much the same setup as yesterday with the beer, only I added the white shoot through umbrella for this. Flash is off to the left. ISO 100, 1/60th, f/4.0.